[EAN: 9780500237397], [PU: Thames & Hudson September 1999], Art|General, Art|Reference, Biography & Autobiography|Artists, Architects, Photographers, Biography & Autobiography|General, In this book, Edward Lucie-Smith relates some of the strangest, saddest, most glorious, and most intriguing life stories of our time. 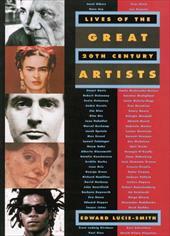 One hundred artists who have shaped our perceptions in this century are presented in lively short biographies. All the entries are illustrated with important works, self-portraits, and photographs, and the book includes an excellent guide for further reading. Clearly grouped according to style and era are modern art's pioneers from Picasso and Duchamp to Louise Bourgeois and Jean-Michel Basquiat. Lucie-Smith vividly evokes the lives of these great personalities and guides the reader through the maze of different styles and movements with authority and verve. Informative and entertaining, illuminated with anecdotes and balanced historical judgment, this is a wonderful collection for everyone interested in the art and artists of the twentieth century. Grouped according to style and era are modern art's pioneers, from Picasso and Duchamp to Louise Bourgeois and Jean-Michel Basquiat. All 100 entries are illustrated with important works, self-portraits, and photos. 273 illustrations, 101 in color. Wrapped in Brodart dust jacket protector. Contained here are the sometimes strange, sad and intriguing life stories of 100 artists who have shaped our perceptions of the 20th century. Grouped according to style and era are both the undisputed greats and the controversial, from Picasso and Duchamp to Louise Bourgeois and Jean-Michel Basquiat. The stories are illustrated by their most notable paintings, including self-portraits, and completed with a guide for further reading.